Went to the jetty around 6pm. It was quite crowded with anglers and cyclist. Manage to jig a few tamban as bait. Only setup one rod and casted out. The downtide was coming to the end after a good current flow. Around 7.30pm…I saw my rod tip shake alittle….went closer to look…it was just moving slowly up and down….I decided to do a full strike,,,,Yes…ON….heavy at the end…..was thinking could it be a small marine cat fish ???? 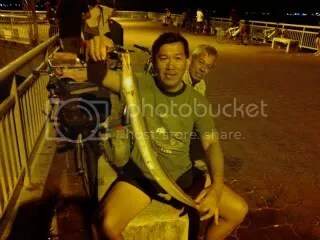 But after winding awhile….I know I had a different fish at the end of the line…It just fight differently…..When surface…it was a small conger eel around one kilo plus….Wow….yesterday night I was just telling my buddy that the conger eel should be coming soon around this time….and tonight I already got it…haha….